When evaluating your SEO performance, you can basically see the different metrics as an iceberg. Above the water you see revenue (or leads if you aren’t ecommerce) coming from organic traffic, which is maybe the most important metric for you to report on. Especially if you report upwards in the organization and need other stakeholders to chip in and understand the importance of SEO. Below the water, you see metrics that strongly correlate with revenue or sales. These are traffic coming from organic or referral or rankings in Google. Finally, at the bottom of the iceberg, you can measure the onsite performance of your website, the authority of it as well as the technical scores of it. These are more difficult to measure but are interesting for you, if SEO is the only thing you work with. In this layer, you build up your SEO metrics not on results but on the work that you do. What is great about this framework is that SEO metrics at the top are dependent on what is below. 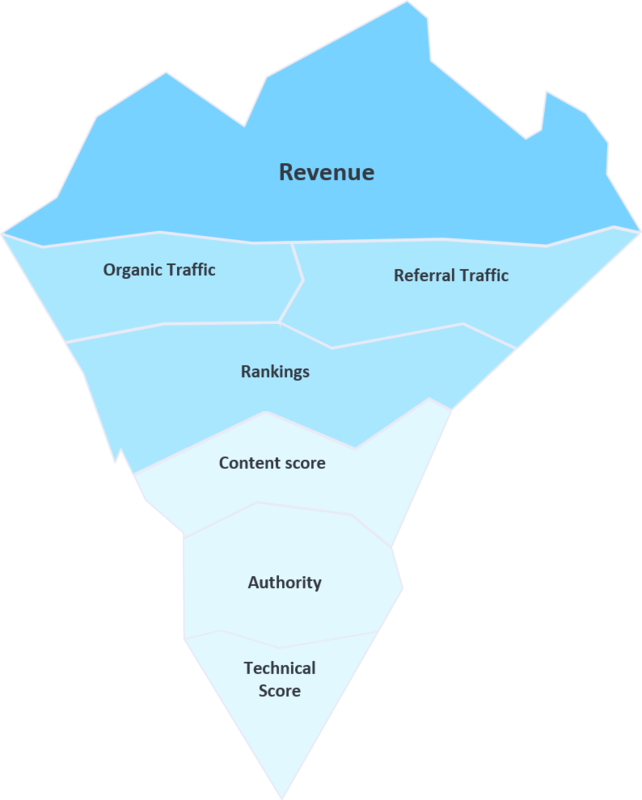 Organic revenue is dependent on traffic, which is dependent on rankings, which is dependent on the onsite score, authority, and technical performance. Revenue: Will most likely be derived from your web analytics setup (either Google Analytics or Adobe analytics). This could, however, also be derived from your BI tool on a broader level than organic traffic, if you are not able to set up correct tracking. If you use Google Analytics but without ecommerce I strongly recommend you set up goals with values that you calculate on averages from your sales department, to at least have some numbers on sales to maneuver SEO from. Organic Traffic: Organic traffic will come from your web analytics tool, whether that is Google Analytics or Adobe Analytics. A tip here to measure more precisely, is to set up filters that sort out irrelevant organic traffic going to certain landing pages. This could be visits directly to log in pages, customer service pages or even the homepage if it’s not ranking for anything other than brand. Referral Traffic: This might be interesting to look at, especially if outreach and building links is a big part of your SEO strategy. Referral traffic will most likely come from Google Analytics or Adobe Analytics just like organic traffic. Also make sure that you filter out traffic from irrelevant sources like partners or other links that SEO is not accountable for. Rankings: This is trickier. Here there are dozens of providers that can give you insights into rankings, visibility scores or share of voice SEO metrics. You can either choose a best of breed tool like Accuranker or a more all-in-one tool like SearchMetrics or SEranking. Content Score: Scoring the quality and onsite optimization of your content can be done by various tools. It’s a bit difficult to integrate it as it requires a bit more crawling power and thus often a more expensive tool. 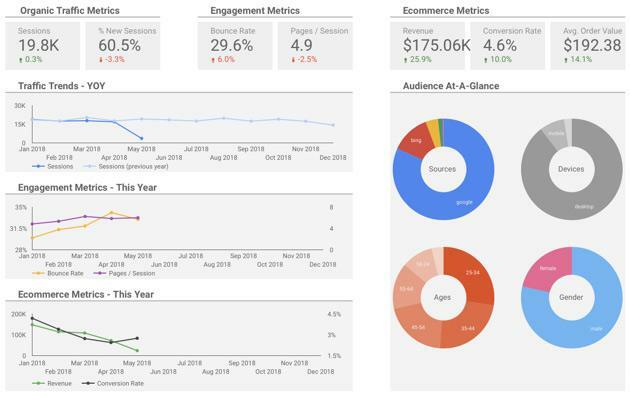 Tools like Brightedge and Searchmetrics have tools for this but I prefer to collect data myself and put it into dashboards whenever a content score data is necessary for a client. Technical Score: Crawling your website on a regular basis and pulling back data on those crawls is essential. It gives you a technical SEO score, which enables you to keep up the technical hygiene and focus on areas that need to be improved. Which of the above SEO metrics and KPIs you and your business should use depends on several different factors. First, your team and stakeholders are important. 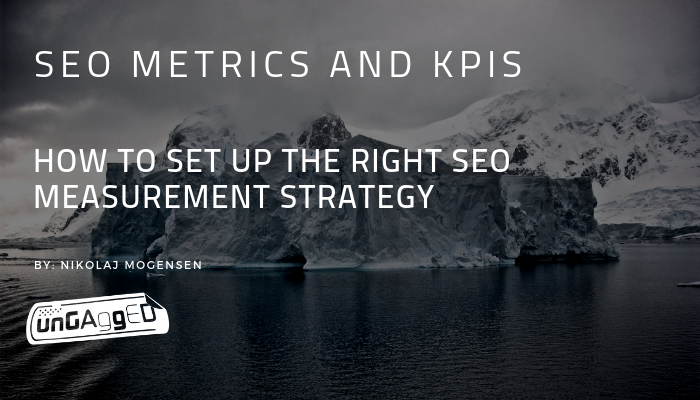 If you are an agency with clients, then you might want to show results at the top of the iceberg but have the bottom of the iceberg as internal success parameters and SEO KPIs for your team. You can differentiate what metrics you use in your organization and what metrics and KPIs you use in your SEO team. This makes sense as the KPIs in the bottom are more operational and lead to actual tasks. If , for example, your content score is decreasing or is low, this would be an obvious place to start. If you were just measuring revenue it might be difficult to know that content optimization is the place where improvements can be made. The problem with measuring at all different levels in the above framework is that data sources are very different. You can’t get one overview of revenue, rankings, links, and onsite performance in one single tool. That means you will either have to look at data separately, building reports based on various data extractions and pulling them together in excel and presentations, or you will have to build dashboards that do it in real time. Obviously, building a dashboard for your SEO metrics and KPIs makes the most sense. The challenge here is to manage data sources, APIs and connecting data point so that they can be used together. When you are choosing SEO tool stacks you should think about several things, as cost can quickly run up. First, what SEO metrics and KPIs would you like to track and report on? Often Google Analytics is not enough for you even though you track everything at the top of the iceberg. Second, do you need to migrate to another SEO tool stack from your current set-up? Migrations often result in building up a completely new dataset, as different tools aren’t compliant. For top level data such as traffic and revenue, you should obviously use Google Analytics. This will provide you with the proper foundation of data when measuring your SEO. In addition, my minimum recommendation for you as an SEO specialist would be to also track rankings on a regular basis (and daily, preferably). You will need to find a rank tracking software that can help you pull out rankings easily and put it into your dashboard. From here you can decide how you want to measure the bottom of the iceberg (404s, load time, crawls, links etc). You can either do it on an adhoc basis or do it weekly, monthly, or quarterly via tools. My SEO tool stack recommendations are Google Analytics, Ahrefs, Accuranker, Deepcrawl, and Screaming Frog SEO Spider. Google Analytics is a must for managing revenue and traffic. Ahrefs is great for links and authority as they, in my experience, provide the most extensive dataset on this. Accuranker is important for daily tracking, and the price is the most competitive on the market. I would recommend Deepcrawl to report and make deep dive onsite audits, and Screaming Frog SEO Spider to perform ad hoc onsite audits and on demand crawls of URL lists. It all depends on the client, market, and needs. So you will have to consider everything above and decide on how you want to measure your SEO KPIs. Should you go for enterprise SEO tools or best of breed? Several SEO tools provide several areas of expertise and promise you that you can do everything with their SEO tool. To some extent, that is true. Choosing an SEO Enterprise tool makes great sense. If you go with tools like Brightedge or SearchMetrics you can build dashboards and track across the whole iceberg from revenue to links. In my opinion, however, Brightedge and SearchMetrics are more jack of all trades tools, rather than best of breed. That means that the data quality and depth of the data is quite average compared to collecting data via other tools. If you choose standalone tools to measure SEO, these can provide you with flexibility and depth within your data, allowing for more complex setups. So the choice is up to you, whether you want one tool to cover it all or want best of breed tools. I prefer the latter and then collect all data points in SEO dashboards. When measuring SEO and keeping track of SEO KPIs the right rhythm is important. You shouldn’t be looking too much or too little at the KPIs. What is important here is to collect all stakeholders and make sure they are motivated and informed about what’s going on. A weekly meeting will often be too much if you only look at results and don’t look at actions and project plans. I prefer having monthly reporting meetings where all SEO KPIs can be run through together with the project plan and roadmap. By forcing monthly or biweekly meetings you also force progress in your SEO strategy. Another good rhythm is to make one of the monthly meetings into a quarterly meeting and one of the quarterly meetings into a yearly meeting where you expand it and take a step back and look at the strategy. No matter what, these meetings should be based on your SEO data and KPIs. I hope this blogpost will help you move on in your SEO measurement strategy. Since 2008 I have been working with SEO and since then one my biggest passions has always been to collect and visualize data from SERPs for clients. The above framework has been one of my cornerstones for a very long time which I use for some of the biggest SEO clients in Scandinavia. AccuRanker has a an exclusive offer for the UnGagged crowd! 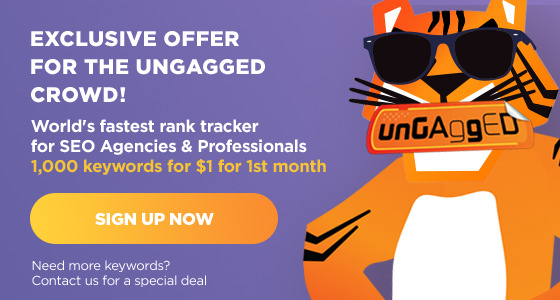 As a participant of UnGagged Las Vegas you can get a Professional Account and track 1,000 keywords for only $1 for the first month. The Professional plan includes unlimited domains, unlimited users, all features, advanced metrics and reporting, as well as all our integrations and easy-to-use REST API. Get your AccuRanker special offer now! Do you need to track more keywords? Contact us mentioning UnGagged Las Vegas and we will give you a special offer for any of our plans. This post was sponsored by AccuRanker, the world’s fastest rank tracker for SEO Agencies and Professionals.